“Today, the Chinese people can say with complete pride that the second revolution of China, the reform and opening up, not only profoundly changed China, but also profoundly affected the world!” At the opening ceremony of the Boao Forum for Asia this year, President Xi Jinping’s keynote speech made a profound summary of the magnificent epic of China’s 40-year reform and opening up. The heavyweight reforms at the two sessions this year also declared the determination that the reform should not stop but start again. They firmly told people that to carry out the reform through to the end is the best commemoration of the 40th anniversary of reform and opening up. Looking back after 40 years, let’s recall the past and look into the future. At this moment, under the background of the community of human destiny in the new era, we need to understand the context and focus on the future, pointing out the way for the thinking and upgrading of China’s textile industry in the new era. The continuous and rapid development of China’s economic construction has created the most important demand and the most fundamental driving force for the great development of China’s textile industry. Starting from the Third Plenary Session of the Eleventh Central Committee in 1978, the work center of the whole party gradually shifted to the modernization construction centered on economic construction. Based on the four decades of practice, social productivity, comprehensive national strength, people’s living standards, and China’s international status have greatly increased, fully demonstrating the great achievements of reform and opening up, and fully demonstrating that holding high the great banner of socialism with Chinese characteristics and taking the road to socialism with Chinese characteristics is The Only Way to realize the Great Rejuvenation of the Chinese Nation . Forty years of reform and opening up have fundamentally changed China. In 1978, China’s total economic output accounted for 1.8% of the globe. Today, China is the second largest economy in the world, with total economic output accounting for 14.8% of the world’s total. In 1978, China’s per capita GDP was only US$384. This year, it will reach US$9,281, which means that China has entered a middle-income country. Forty years of reform and opening up with economic construction as the center and a socialist market economy as the target model have made China the world’s largest textile producer, consumer, and exporter. The reform and opening up has enabled the textile industry to achieve high-speed development in terms of productivity quality, industrial scale structure, and industrial competitiveness. China’s textile industry has adopted advanced technology on a large scale and its independent innovation capability has achieved significant development. This benefited not only from the entrepreneurial and innovative vitality brought about by reform and opening up, but also from the increasing prosperity and improvement of the domestic market. Moreover, it also benefited from China’s independent and peaceful foreign policy and its continuous expansion of its opening up policy, so that the textile industry can seize the rare international opportunities. The textile industry gave fuller play to human resources advantages, industrial structure advantages, attracted large-scale advanced technology and advanced management experience, used domestic and international resources, and opened up domestic and international markets, achieving great successes. In 1978, the textile industry achieved a total industrial output value (constant price) of 47.32 billion yuan, accounting for 11.2% of the country’s total. The total profit and tax amounted to 10.96 billion yuan, accounting for 12% of the total. The export value was 2.154 billion U.S. dollars, accounting for 22.1% of the total. In 2017, the main business income of textile enterprises above designated size reached 6893.565 billion yuan, which was 145.67 times that of 1978, accounting for 5.9% of the industries above designated size in the country; in 2017, the export of textiles and garments was 274.51 billion U.S. dollars, which was 127.4 times that of 1978, accounting for 12.13% of the total exports and 36.8% of the total global textile and apparel trade. The net foreign exchange earned by the entire industry was 241.9 billion U.S. dollars, accounting for 57.3% of the country’s total. The reform and opening up has opened the world’s largest domestic market for the Chinese textile industry. In 1978, China’s per capita fiber consumption was only 2.9 kg, which was 38% of the world average, which exceeded 20 kg in 2015 when the quantity and structure of fiber consumption were gradually approaching that of medium-developed countries. In 2016, the per capita clothing expenditure of urban and rural residents in China reached 1,739 yuan and 575.4 yuan, 16.7 times and 17.4 times higher than in 1985 respectively. At present, China’s textile industry still shoulders its own historical mission: it solves the employment problem of more than 20 million people across the country, and is a pillar industry for China’s foreign exchange earned through exports. As a traditional pillar industry of the national economy, an important livelihood industry and an industry of obvious international competitive advantages, the industry has played an important role in attracting employment in the booming market, increasing the income of farmers, accelerating the process of urbanization, and promoting the harmonious development of society. Therefore, the “increasing demand for a better life for the people” is the core driving force for promoting high-quality development of the industry. Promoting high-quality development will be an important task for the textile industry at present and for a period to come, while promoting high-quality development and blazing new trails is an important focus. In President Xi Jinping’s report of the 19th CPC National Congress, the word innovation appeared more than 50 times, so the industry must firmly grasp innovation, continue to promote innovation, and effectively implement innovation. At present, China’s textile industry is accelerating its goal of becoming a strong nation in textiles. This is a complicated and arduous task. It is necessary to overcome a large number of unbalanced and inadequate problems accumulated during the extensive development of the industry in the past. The imbalance was first reflected in the imbalance in the industrial structure. While satisfying the needs of the people for dressing, the demand for other textiles in the people’s lives is far from being met. At the same time, the imbalance remains in regional structure, enterprise structure, infrastructure, and product structure. Insufficiency is mainly reflected in the fact that as manufacturing, the integration of textile and cultural industries is still far from adequate. Consumers’ demands for personalization and customization of textiles and clothing reflect the spiritual needs of the people for a better life. In the new era, fully satisfying consumer demand for beauty is the focus of inadequate resolution. The textile industry is a people-enriching industry, but in precision poverty alleviation work, the role of precision poverty alleviation has not been fully played; the textile industry is a green industry, but the role of green manufacturing is still far from fully reflected. The industry must solve these inadequate and unbalanced issues, and innovation is an inevitable move. Today, the Chinese textile industry has stepped into a new stage of “innovation driven”. The innovation of technology is reflected in the core of the material productivity; the innovation of brand is embodied in the aspects of material security, consumer satisfaction, and the ability to participate in international marketing; while the cultural innovation reflects the innovation of value. 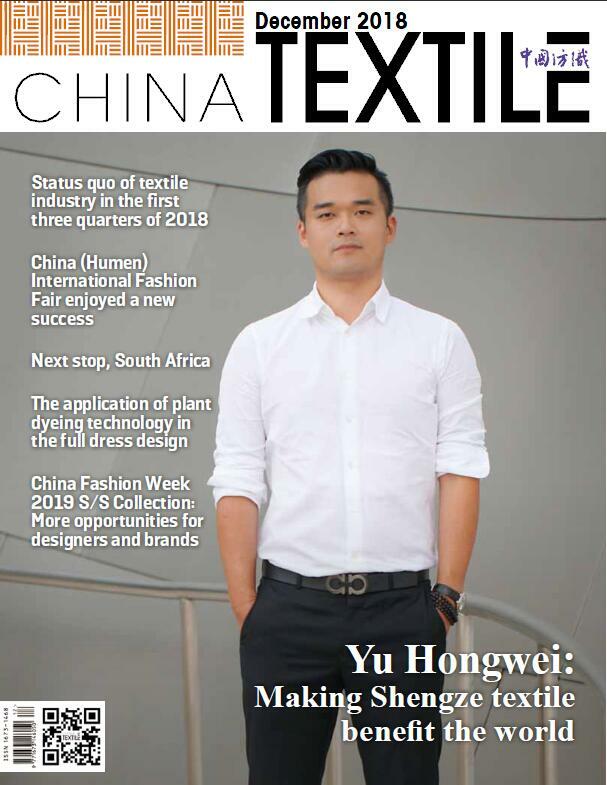 In the “13th Five-Year Program”, China’s textile industry put forward that it is necessary to further consolidate and improve China’s textile industry’s advantages and status in manufacturing and international trade, form such a development pattern of the textile industry as innovation-driven development, improved quality and efficiency, significant brand effects, and strengthened international cooperation, create new advantages in international competition, and initially build a textile power. Entering a new era and starting a new journey, the Chinese textile industry will surely follow the outstanding spirit of entrepreneurial development and development of several generations of textiles, inherit and develop, persist in innovation, and move forward in the new orientation of textile industry － technology, green, and fashion. 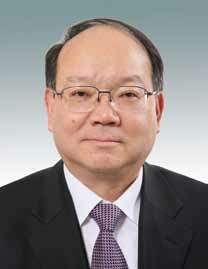 Chinese textile industry must be able to shoulder the historic mission of a new era. President Xi Jinping pointed out: “Upholding the Party’s leadership and comprehensively managing the Party strictly is the key to the success of reform and opening up.” The Party Committee of CNTAC has always been resolutely in line with the Party Central Committee, and under the leadership of the SASAC, the Party’s work arrangements will be fully implemented and the Party’s various principles and policies will be carried out to the letter. It will play its role as a core force in building a distinctive socialist market economy and in building a unique national industry association. During the 40 years of reform and opening up, CNTAC passed through such stages as the Ministry of Textile Industry, China Textile Federation, National Textile Industry Bureau, and China National Textile and Apparel Council. The textile industry has also entered a new phase of industry self-regulation by social intermediary organizations for service and coordination. The “Opinions on Reforming Social Organization Management System and Promoting the Healthy and Orderly Development of Social Organizations” issued by the General Office of the CPC Central Committee and the General Office of the State Council stated that “social organizations mainly composed of social organizations, foundations, and social service organizations are the important forces of socialist modernization,” and “support the social organizations, especially industry associations, to play a role in serving the development of enterprises, standardizing the market order, conducting industry self-discipline, setting community standards, safeguarding the interests of members, and mediating trade disputes, making it an important drive to promote economic development,” indicating that the central government attaches great importance to the industry associations. Therefore, CNTAC needs to keep in mind the two hundred-year goals and the Chinese dream of rejuvenating the Chinese nation. We must implement the development concepts of “innovation, coordination, green, openness, and sharing” established by the Party Central Committee in the industry. CNTAC will truly become a lubricant and accelerator for the development of the textile industry. It will accelerate the transformation and upgrading of the textile industry, enhance international competitiveness, and achieve the goal of building a textile power. As an industry association, CNTAC should become a good assistant and a good adviser of the government. It should serve the enterprise well, adhere to the intimate contact with the enterprise at the grass-roots level, think of what the enterprise wants, be anxious about the needs of the enterprise, do what the company needs to do, hear the voice of enterprises, reflect the demands of the industry, and be a good bridge between enterprises and the government. However, we must see that we are still on the way to the reform of national industry associations. There are still many deficiencies in both concept and practical work. Therefore, in the future, we must continue to carry forward the spirit of reform and innovation, and constantly summarize and improve our work. We will work together to create a National Industry Association with Chinese characteristics and work hard to make our country a world textile power as soon as possible.